Very few games have attracted as much attention upon their release as EggOMatic but this NetEnt developed slot is proving exactly why its release was so hotly anticipated. 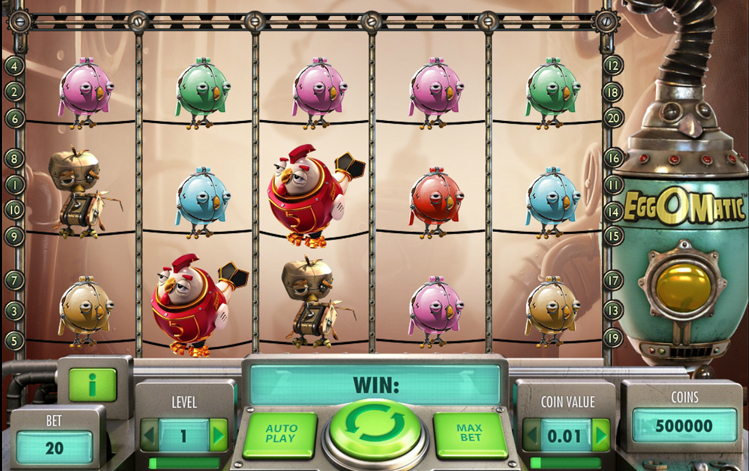 EggOMatic is a 5-reel, 20-payline online slot title that is one of the best-looking in the Net Ent portfolio. You are sure to keep coming back for more. Fans of other NetEnt slots such as the innovative Evolution and the Aztec-themed Gonzo’s Quest will feel at home with the slick graphics but this is a game that offers more than your average slot. The Wild symbol is represented by a rooster carrying a Wild icon. The Wild symbols substitute with symbols across the reels for the highest potential winning combination on a single pay-line. In addition, the feature egg (more on that shortly) located on the conveyor belt above the reels is triggered when one of these Wild symbols appears on the reel below the egg. Now, back to that feature egg. There are four different types of feature eggs that the chickens can lay that will move along the conveyor belt on top of the reels. These include a Free Spins Egg, Coin Win Egg, Spreading Wild Egg and a Surprise Egg. As stated above, these eggs are triggered and accessible to you if you manage to hit a Wild symbol on the reel below where the egg is positioned on the conveyor belt above the reels. It’s a great new feature that adds a new element to the slot game. It is worth noting that if you manage to trigger the Free Spins Egg then you will win up to 50 free spins. Other symbols in the game consist of different chickens that are dressed in robotic gear or the symbols are actual robotic chickens. Each character has their own personality and appearance. EggOMatic lives up to its pre-release hype - at least in the look. 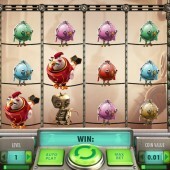 Ok, so the chickens and rooster can prove annoying but this is a chicken-themed slot - turn the sound off! The gameplay will be enough to make it worthwhile sticking around. Big prizes, lots of features and endless hours of slot fun can be found with this slot that is destined to become an all-time classic.